For the past week or so we have been trialling the soya ladder again. This is our second attempt as we put the ladder on pause a month back due to the heat and restless nights. I’ve been keeping a diary to keep track of any reactions, the time of testing and the quantities. If anyone is about to start their own food challenge I would definitely recommend doing this. The issue I have with doing food challenges and ladders is that I am constantly looking for reactions which may turn out not be linked to the food at all. Little one’s bottom canines are coming through so this does have an impact on her tummy. This is where I found an allergy and food diary comes in handy. I note down any changes such as teething, the weather, holidays etc and see if there is a pattern. So far we’ve been slowly increasing the amount of soya yoghurt little one has been having each day. We started off with a 1/4 of a teaspoon and we are now at a couple of tablespoons. The main problem we’ve had is that little one absolutely loves it and would quite happily slurp her way through an entire pot, so much so that she gets upset when she’s finished her portion. As I haven’t noticed any big reactions we’re slowly continuing on with the ladder. Her skin mm is still itchy, with eczema in the usual patches however it isn’t getting any worse (it’s not getting better either!). Ideally it would be good to start the ladder when little one has clear skin so that reactions would be more obvious. However as little one’s skin is rarely clear it is more about judging what is normal for her and the current conditions. I’m also avoiding trying too many new foods whilst doing the soya ladder as I want to be able to identify what difference the amount of soya has. REMEMBER: This is based on advice from MY little one’s dietitian. Before trialling a food challenge or attempting a food ladder I would always advise that you seek professional advice from a doctor who knows your child. I’m really hoping that soya is something that little one can tolerate as it will open up a wide range of foods for her to enjoy. 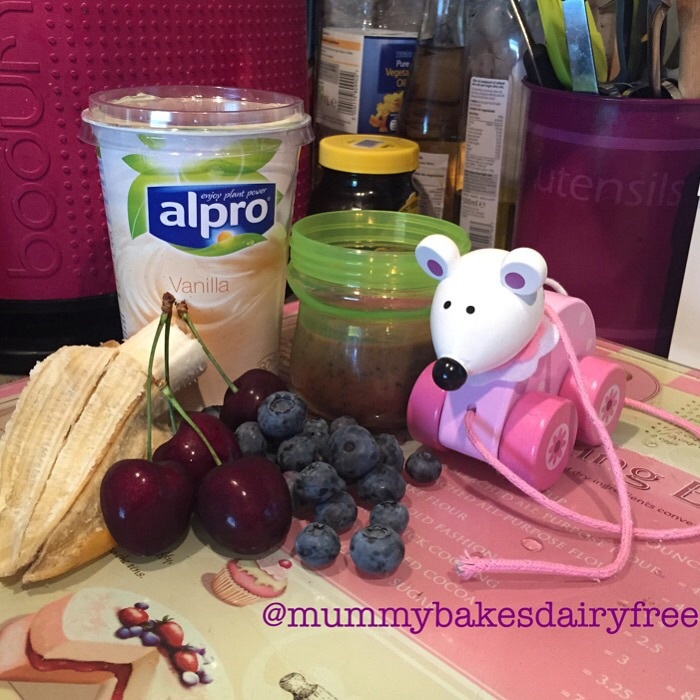 Taking inspiration from Instagram and the #instaweanteam, I used a little of the soya yoghurt to make a smoothie for little one this week. I’ve mentioned the #instaweanteam before and they are great for encouraging you to try new ingredients in your meal planning. Each week they suggest an ingredient to try and then each day one of the Instawean Team will post a recipe including that ingredient. They come up with some great ideas and it’s something that makes me try to be more adventurous. Scooping out smoothies is much more fun! So the smoothie I made for little one was pretty simple but was a massive hit! The ingredients are pretty flexible and really depend on your tastes and the contents of your fridge! We had a Cherry, Blueberry and Yoghurt Smoothie and it was delicious. 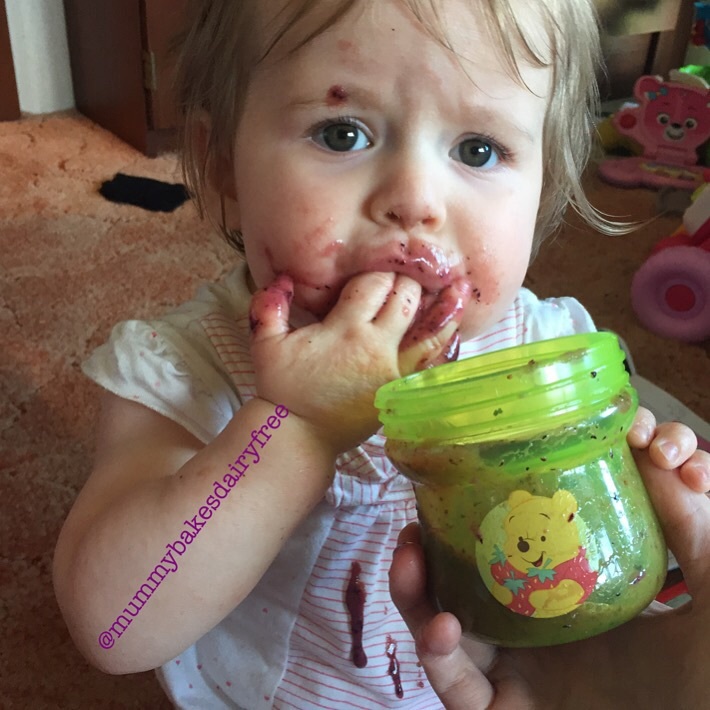 Little one abandoned drinking the smoothie and used a Winnie the Pooh technique by scooping it out of the pot!! 1. Wash the fruit and chuck into the blender. 2. Add the yoghurt, banana and whizz until smooth. 3. Pour into a cup or bowl and serve. It really is very simple but as always you can add twists to make it your own. Change the fruit you include- raspberries, strawberries, blackberries etc. You could use it as a topping for breakfast. Add a squeeze of runny honey to sweeten. Increase the amount of yoghurt for a thicker smoothie and top with more yummy fruit! 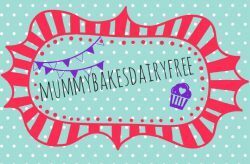 Dairy, egg, nut and gluten free. Could be soya free depending on the yoghurt you use. It is freezable depending on the yoghurt you use. Alpro Soya doesn’t recommend freezing. Next Post Sweet Potato Pancakes and A New Business Venture!